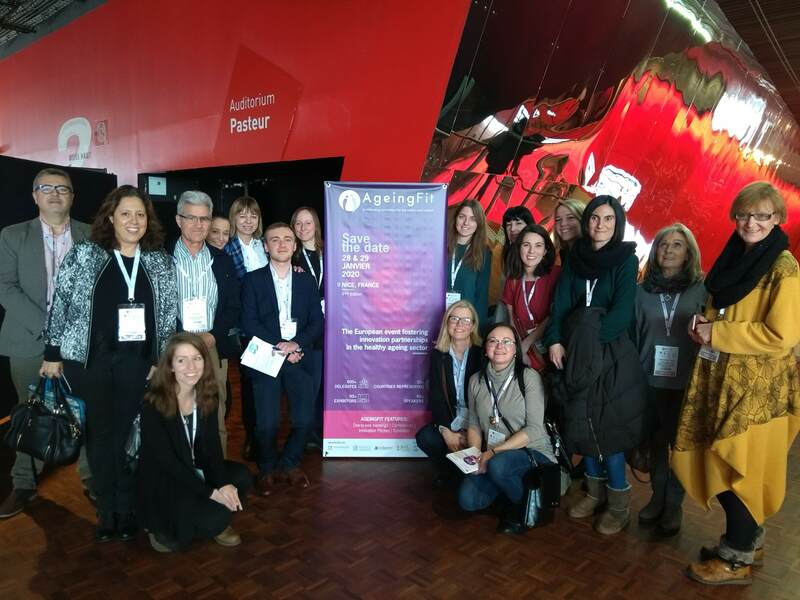 SILVER SMEs partners met in Lille and attended AgeingFit, a European event dedicated to innovation partnerships in the healthy ageing sector, which was organised in Lille (France), on 29 & 30 January 2019. Silver Health covers the field of prevention allowing seniors to be autonomous and in « good health » as long as possible. It also includes the care of old and sick people staying in hospitals or geriatric homes. It is one of the three themes of SILVER SMEs along with ICT and housing. Several good practices were showcased during AgeingFit, both innovative products such as protein-rich foods developed by Nutri’earth, fall sensors developed by Unaide, voice-controlled robots developed by Cutii, and even games such as the multisensorial game platform developed by Connect’age; but also, innovative partnerships. In terms of innovative partnerships, innovations concerned both the funding side and the organisational aspect. An interesting example of funding is Silver Surfer, a publicly funded call for projects targeting SMEs in the Silver Economy in France. Its particularity comes from involving end users (i.e. elderly people and medical staff) in the jury to ensure that the project fulfils existing needs. Public funding turns out to be essential in most innovative organisational initiatives, at least at the beginning, with the example of the Interreg 2 Seas project, “Transforming Integrated Care in Community”. The project aims at creating self-managed teams of 6 to 12 people, distributed by district, to provide free home care services to elderly people and it is based on the Dutch “Buurtzorg” method. During that event, SILVER SMEs partners were invited to speak at a round table through the voice of regional entrepreneurs and policy-makers to give feedback on the challenges they faced as business developers in the Silver Economy sector and on existing regional policy support schemes. The three entrepreneurs were Damien Roche representing the Lifebloom start-up currently working on an exoskeleton to help mobility-impaired people to walk, Pedro Villanueva from the Ariño spa in Teruel (Spain) developing health programmes to diversify his offer, and Sandra Salvado from Country Property Spain who are building a resort for European seniors to retire in Spain. These three entrepreneurs all insisted upon the necessity of public funding to make their product or service affordable because of high infrastructure and development costs, of a lack of private investment and of a will to make as affordable as possible their product and/or service to the seniors. The two Spanish entrepreneurs also touched upon the issue of the availability of a skilled work force in rural areas due to a lack of integrated approach to the local development. Damien Roche added the need for more information for entrepreneurs about the EU market and Member State specificities to facilitate an easier market access for SMEs. In the responses brought by the policy-makers during the second part of the round table, it appeared that the three regions which were represented – Hauts-de France (France), Dalarna (Sweden) and Castilla y Leon (Spain) – all had implemented a strategy linked to ageing, but not necessarily including specific actions directed to SMEs. To a lesser extent, Castilla y Leon’s Strategy for the prevention of dependency and promotion of active ageing provides an integrated healthcare answer with affordable costs for all but no support to SMEs. The Dalarna region chose to support the regional innovation ecosystem through smart specializations including for instance the Silver Economy priority but without directly interacting with SMEs. And finally, the Hauts-De-France region seemed to have the most integrated approach with a regional steering committee for the Silver Economy including institutional and economic actors and an investment budget of around 500 million euros a year representing 110 000 jobs. This money is spent both in the public sector or for private initiatives through call for projects targeting SMEs for instance. However, none of the regions have developed a specific approach for rural areas. support the transfer of small businesses in rural and mountainous areas operated by elderly proprietors to younger people. Focus on the pension needs of overall populations as the numbers of elderly persons expands and promote policies to ensure that all citizens make adequate financial provision for their old age.